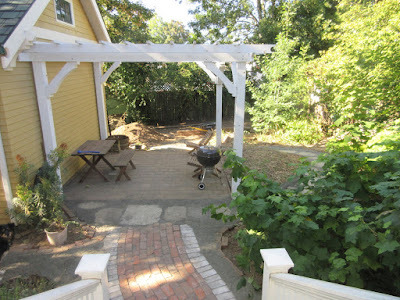 The backyard is finished, for now. We still plan to put in a chicken coop, but that will wait until fall/winter when our contractor friends have a slow period. Here is the overhead view (from my sewing room). 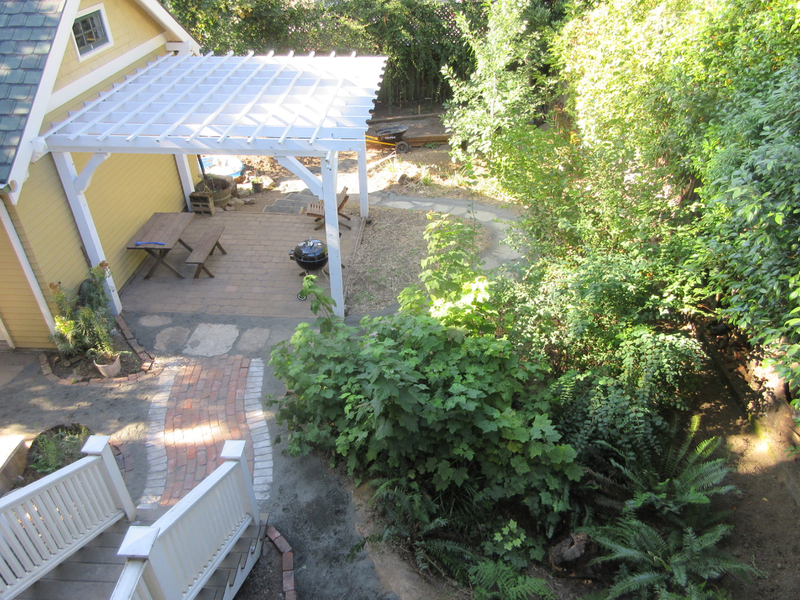 The mass of plants on the lower right is the rain garden we put in about four years ago. The few plants we originally put in have really thrived (the thimbleberry too much so). And from the back stairs. Honestly, had we planned in advance better, the brick path would have extended all the way to the patio and the urbanite path would have come off the side, but we were pretty much winging it for most of this process. Oh well. Maybe next year we'll change it, but Jeff has had enough of this project for now. We'll hang onto the spare bricks. I spent the day sifting the last of the tile to get it out of the house. I'm trying to guess which pieces are worth selling, and I'll put them up on craigslist for the rest of the summer. The rest, I'm just going to put a free ad up on craigslist. I think whatever is left by this winter, I'll just give that away too. Thimbleberry? Is that like a raspberry? We planted them for the birdies, but they haven't found them yet. We eat what we can, but most go to waste. That is how mulberry and wild raspberries are, too. No shelf life. I want to plant some paw paw trees and they say their fruit has zero shelf life. But they are suppose to be healthy for you.